The Union Jack Club in Central London is a quiet pivot at the centre of British history. It is the club where people connected to the armed services traditionally come to stay when they’re in the capital. These doors have admitted corporals and Queens, generals and ghurkas. When you enter, you see wooden panels carved with the names of the heroes and (rarely) heroines of a hundred-plus years of wars. Colonial wars, anti-fascist wars, Cold War, the War on Terror, civil strife in Ireland, strikes against Iraq and Afghanistan. There are paintings of men on horseback, men in helicopters, jets, tanks, camouflage and bright red cavalry tunics. The library has deep green leather seats, and around you are the books that tell of these wars, titles like The Fall of Berlin, Rat’s Tales, Raiding the Reich, or No Time to Wave Goodbye. But we are not here to talk about battlefields, we are here to talk about their consequences. Lois and I are staying at this iconic club to meet the group of women who run The War Widows’ Association, women whose remarkable lives bring a different perspective to those same battlefields. Among the medals and the honour calls, they’ve also displayed great bravery in the face of conflict — but their stories are unheard, do not exist in the museums, are not recounted in the histories. And we are very privileged to be invited to take part in the first-ever gathering of their stories. Being arthur+martha, our contribution to this wider War Widows Stories will be a collaborative quilt and poems, that complement the oral history recordings and wider research currently being made by Dr Nadine Muller. But today is a day for hellos, getting to know faces and gather ideas to fuel this longer conversation. 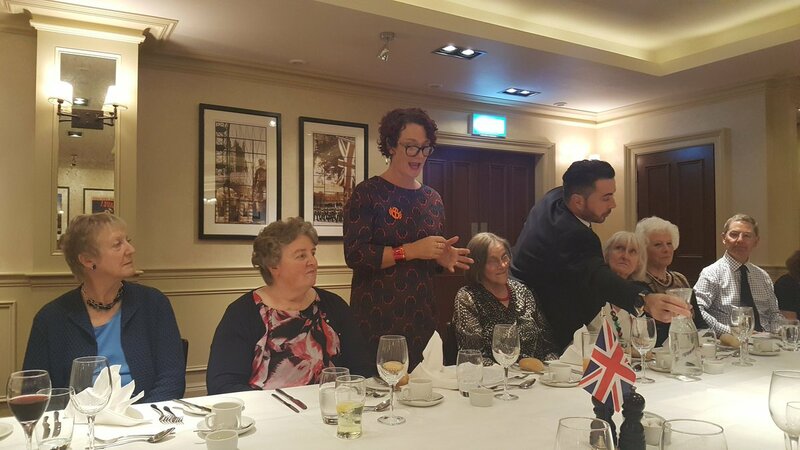 The occasion right now is an evening meal for the regional managers of The War Widows’ Association: the big, bustling group is full of energy, jokiness, and a vibrant camaraderie as we sit down for tea. The cliche of widowhood is somber and soft-spoken, however this evening was spent talking loudly, eating heartily, laughing loud. Lois Blackburn introducing the art making to the War Widows’ Association. Photo courtesy WWS. arthur+martha give thanks to our supporters for this project Arts Council England, the Arts & Humanities Research Council, the British Academy, Liverpool John Moores University, Royal Museums Greenwich, the Imperial War Museums, the National Memorial Arboretum and the Heritage Lottery Fund. I’m currently looking at the Stitching the Wars quilts, I’m checking to see if there are any repairs to be made. They’re about to take another journey, this time their off to York to the Quilters’ Guild to be archived in their collection. While I’m stitching, making repairs my mind is musing about the life this quilt has already had. It’s a quilt that is been made by many hands, (over 500 people contributed) some nimble, some inflicted with arthritis, seen by sharp eyes and those with limited sight. whilst making it people chatted, their minds wondered, they shared memories, day to day concerns and delights. For some the simple pleasure was working with rich colours, many delighting in the pleasure of enjoying different textures of fabric in their hands, from silks to felts, to knits, velvets and tweeds, for people living with dementia, this multi sensory experience can be hugely beneficial. Workshops took place in day centres, a hospice, craft groups, dementia cafes, Libraries, always with cups of tea and biscuits. Materials for the quilts was donated, brought from charity shops and occasionally from fabric shops. Fabric was dyed in big baths of colour, inspired by the Derbyshire landscape for a bombers moon and by colours associated with wealth and grandeur, for fresh air and poverty. As the quilts grew in size we found space to look at them and put them together where ever we could, whether that was the floor of a library, or the largest tables we could find. I would stand bouncing on a chair to try and get a view of the whole. When you are making quilts it’s all about the touch, then they take on a different life, in exhibitions, there is rarely touching allowed. I am very keen that the work gets shown in a wide variety of venues. First of all the quilts get shown to the people who have collaborated in the making of them. Then we have mixed grand venues with more humble exhibition spaces. From the National Trusts Lyme Park, a viewing by Prince Charles at the Farming Life Centre, the walls at Buxton Art Gallery and Museum, they have sat along side books in a tour of Derbyshire libraries, and exhibited at Derbyshire Record Office, archives shown alongside photos from our book, and from Pictures of the Past. Dorothy, one of our participants, and her embroidery ‘Clouds Farm’. Every time I look at the quilts I see something different and memories are sparked for me, memories of the people who made the work and the stories they shared, the struggles they overcame to stitch, to remember. The delight in sharing, the excitement in seeing the work coming together. The awards of having your voice and talents shared and respected. As I look at it today the colours have never seen seemed so vivid, the work so full of life. I’ve had my hands and eyes over every square inch of this quilt and yet I am seeing something new today. It’s nearly time for me to let them go and pass them on for another life and I can’t think of a better place for them to go to. In the safe hands of The Quilters’ Guild, the quilts will be photographed, kept safe for posterity and will be a available for exhibitions, as learning tools, to be enjoyed and a record of all the people who helped make them. Seeing them today has reignited my passion for this art form there is so much more to explore and to share. I am thrilled that these two quilts that has meant so much to the people who have made them, will be looked after with so much care and shared around the world.